This fine Milanese cello was formerly a highlight of the Albert Cooper Collection. One of the great British collector-dealers of the 20th century, Cooper traded in violins from his idyllic Hampshire cottage, showing an unerring eye for quality. After his retirement he consolidated his collection, publishing a two-volume catalog in 1996. In his last few years many of the greatest instruments, including this cello, were sold off privately and other highlights were bequeathed to the Ashmolean Museum in Oxford. In 2008 the remainder of his collection, some 200 lots, was sold at auction. This cello, made around 1690, provides an interesting comparison to the recently featured c.1700 Grancino cello. It features the lustrous reddish-brown varnish typical of Grancino’s work until the 1690s, when he substituted it for the harder orange varnish seen on the c.1700 example. In other respects, however, this instrument is an example of his mature work and the outline, now slightly reduced in the upper bouts, demonstrates an awareness of his Cremonese contemporaries. 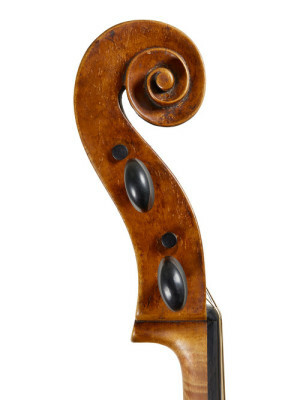 The soundholes, identical to those of the c.1700 cello, are Stradivarian in concept, but their design is personalized and unique to Grancino’s work. The plain maple chosen for the back is typical of Grancino and consistent with the economical Milanese approach to making. The quality of craftsmanship is clear, and the characteristically narrow and delicate edge of the instrument testifies to Grancino’s careful working methods. The low but somewhat peaked arching, reminiscent of the work of Nicolò Amati, is a sculptural tour-de-force. The demand for violin making in Milan appears to have changed dramatically around 1690. Works by Grancino date from as early as the 1660s, but only a small number of instruments survive from the first three decades of his career. The majority of his oeuvre comes from after 1690, when Milan was sustaining a growing community of violin makers living and working on the Contrada Larga. Labels of Carlo Giuseppe Testore exist from about 1690, describing him as ‘allievo di Gio. Grancino in Contrada Larga in Milano’. His instruments have a great deal in common with those of his teacher and they probably cooperated with each other extensively. 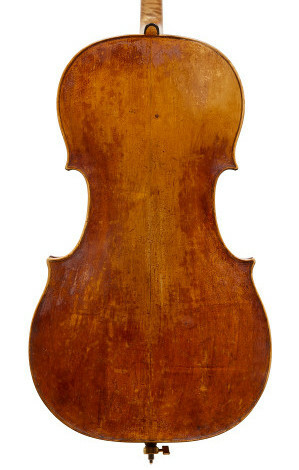 In the case of this cello, the flat back of the pegbox is typical of Testore family work and the volutes of the scroll lack the precise symmetry associated with Grancino, being slightly oval and erratic with a somewhat bulging profile to the pegbox – classic indicators of C.G. Testore. However, the softness with which the chamfers of the scroll are turned is reminiscent of Grancino’s Amati-inspired workmanship of his earlier period. Overall, as can be seen from this cello, the early 1690s style of both makers was extremely similar, except for the marvelously distinctive soundholes, which remained Grancino’s signature for the rest of his career.